Situated at the Eastern end of Sea Hill this huge stone has split into two separate pieces. Standing at 3.75 metres in height and 2.6 metres wide the part that remains standing is the bigger portion. The other slab lies on two uprights at an angle of 45 degrees. 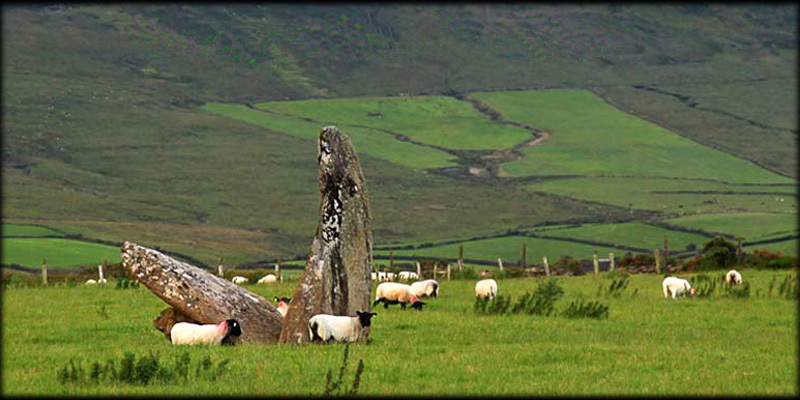 I was unable to get up close to this megalith put hope to get a bit closer on my next visit to Dingle Peninsula, as you can see from the images the stone is in a lovely situation and well worth a visit. Situated: From Dingle take the N86 East after 10 kilometres you come into Banoge village take a right turn here for Minard Head then right and left. after 400 metres take a right turn then take the next right at the crossroads the stone is in a field approx 400 metres down this road on the Northern side. Discovery Map 70: Q 5313 0041. Last visit Sept 2012.